This spring I coached Elizabeth Wicks who set a women's age 65-69 12-hour record of 172.5 miles! Here's how we did it. This is the third in a three-part series about how we did it (Part 1 and Part 2). You've trained hard as recommended in the first article and you've dialed in your nutrition as recommended in the second one. Now you "just do it," right? 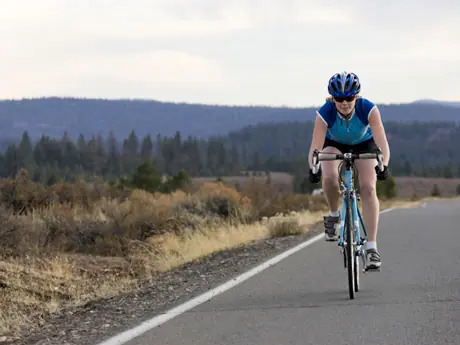 You could try that approach, but you will have a much more enjoyable and successful ride if you think about how to approach the event and how to ride on race day. A showstopper is something that forces you to quit before the ride is over. Almost any showstopper can be eliminated through thorough preparation and proper ride management. Test everything. Try nothing new on an important ride. Don't give up. It's not a showstopper unless you decide it's a showstopper. This article explains how to eliminate potential showstoppers for your first ultra event. A successful ride starts several weeks before the event itself. As recommended in the first article after laying your endurance base and building your power on top of that foundation, peak by training specifically for your event. If you live near your event, you can break the event into smaller pieces and pre-ride each section of the course. If you don't live near the event, you can still practice in similar terrain and conditions. If you live in flat terrain and are preparing for a hilly event, use the wind. Ride for several hours into a headwind to develop the pacing and mental focus for long climbs. Simulate endless rolling hills by doing training rides that alternate headwind and cross- or tailwind sections. You can refine your practice rides by using them to simulate the event experience itself. Suppose you are preparing for a 200-km or double century. You could do a similar 100-km or 100-mile ride that has climbs and valleys (or headwinds and tailwinds) in places similar to the event. During the ride imagine that you are riding the full double century. Where would you be during the event? What time of day would it be? How would you feel? What problems might you encounter? How would you solve them? John Hughes has earned coaching certifications from USA Cycling and the National Strength and Conditioning Association. He is the author of Distance Cycling: Your complete guide for long-distance rides. He has also written many articles on training, nutrition, cycling skills, medical issues and sports psychology for RoadBikeRider.com. He enjoys coaching riders with a variety of goals and fitness backgrounds. Visit his website at Coach-Hughes.com. Should You Fuel for a Crit?